This post has been sitting around, half-formed, in my Blog Posts folder since I saw this movie in November. I still don’t feel like it says much, but here, have it anyway… maybe it’ll help if you’re choosing what to watch on video? 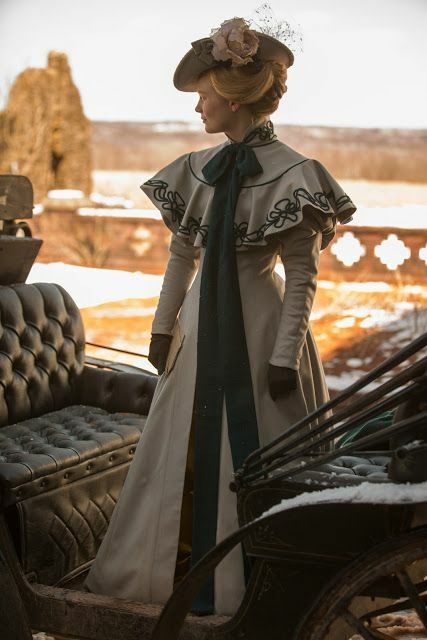 Guys, I need to write about Crimson Peak. This movie blew me away. I was transfixed throughout the whole thing, hand-to-mouth with shock in some parts. It was everything I had hoped for and more. Visually stunning. That’s Guillermo del Toro for you. The red clay that dyed everything in Allerdale Hall bloody red was… improbable, but beautiful and thematically satisfying. The attention to detail is pretty much what you’d expect from del Toro. As somewhat of a connoisseur of Victorian fashion, I can say that even the clothing tells a story. Lucille Sharpe (Jessica Chastain)’s by contrast, are the heavily-swagged gowns of the late 1870s/early 1880s in deep, saturated colors; also notably, she wears a high-necked day dress in the ballroom/waltz scene while everyone else is wearing sleeveless evening dresses. 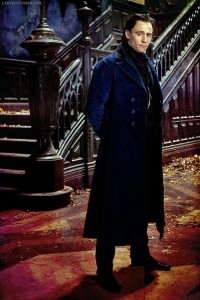 As for Thomas Sharpe (Tom Hiddleston), Edith remarks that his clothing is ten years out of date. Indeed, his velveteen frock coat and satin waistcoats and cravats strike me as more 1880s than 1890s. 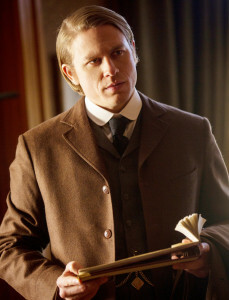 Especially contrasted with Alan (Charlie Hunnam), who wears a more modern cut (shorter, squarer) and is more drab. I would turn neither gentleman out of bed for eating crackers. 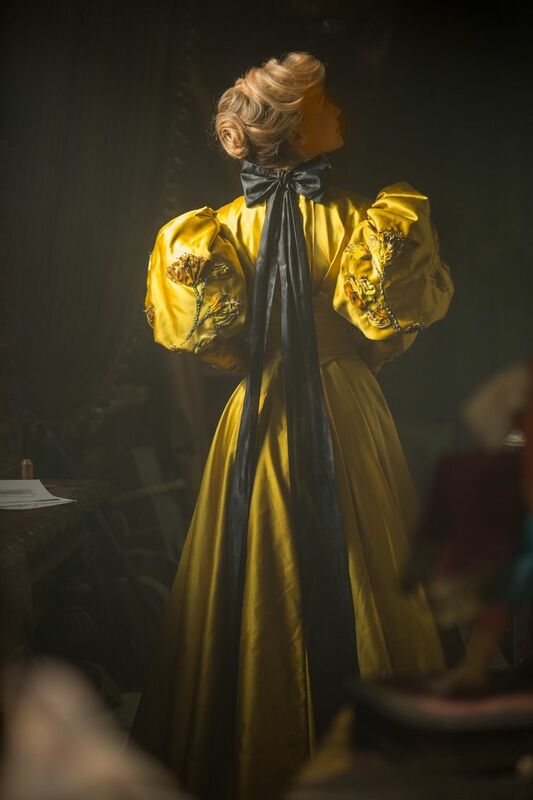 What does this costume design tell us? It paints a picture of the Sharpes’ morbid fascination with the past and contrasts it deftly with the breath of modernity that Edith and her companions represent. 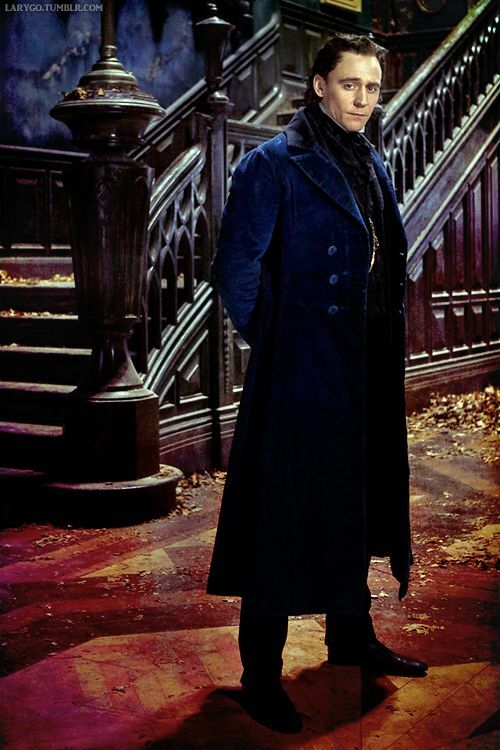 Also, apropos nothing, I kind of want to be Thomas’ blue velveteen coat for Halloween some year. Not him — just the coat. Alsoalso, I’d be lying if I said I didn’t enjoy staring at Tom Hiddleston for two hours. He is a shapely man who fills out a frock coat well. He plays the same sort of doomed, beautiful, broken man he plays in every movie, it seems. Satisfyingly gothic, with modern sensibilities. There’s a great video out there of Tom Hiddleston explaining what gothic romance is. He pretty much gives the textbook definition, too. It’s delightful. The joke about the gothic novel is that it’s “girl meets house,” and this is true here — Allerdale Hall is as much as character as any of the humans, with its water running red, its clay pits, the snow falling through the gaping maw of the roof, the sounds of its breathing. Its inhabitants are corrupt and doomed, with a sense of dark noblesse oblige that ties them to the house. Thomas, in particular, is the classic brooding gothic hero, with redemption perpetually out of his reach. The ghosts, and the violence that births them, are much more real and unabashed than in a gothic novel, though. There’s a scene early in the film that ambushes you with its violence and brutality, in a way that a 19th century novelist would shy away from. It’s still beautiful even in its horror, in classic del Toro fashion. A horror movie, maybe? I hear it’s gotten panned for “not being scary.” I guess? There aren’t a lot of jumpscares, but there is a lot of creeping dread. It evokes fear less than it does unease. Executive summary: It is beautiful. It is wildly unbelievable. See it.